As a celebration of my latest Moda Bakeshop (MBS) tutorial called Strawberry Fields Forever! 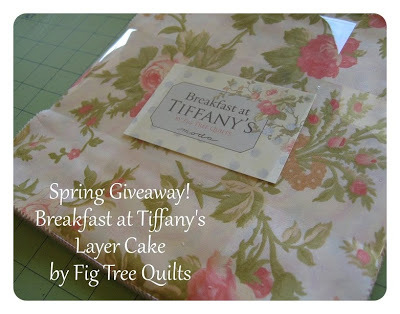 (I’d love it if you left me a comment if you feel so inclined), I wanted to host this Layer Cake giveaway as my tutorial requires only one layer cake to make the quilt top. For those of you that frequent my blog, you may recognize this quilt as I’ve already made two using this pattern: my Quilt for Japan using the Sunkissed collection, and of course, Strawberry Fields Forever (original post found here). Make one yourself using your favorite collection by checking out my MBS tutorial! And just as a side note, if you like sewing tutorials and if you’re addicted to fabric, I urge you to ‘Like’ me on Facebook (by clicking the button below). See how convenient I’ve made it for you?! And/or if it’s more convenient to follow me on blogger, there is a ‘Follow’ button to the right. That’s it! I will draw your name using a random number generator so be sure to leave some way for me to email you. I will post the winner next Friday. And yes, I will ship international! Have You Tried Spray Basting? 195 Responses to MBS Tutorial and a Giveaway!!! 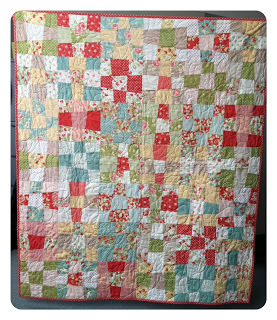 Loved your MBS post, such an adorable quilt and it looks so easy. I seem to go in cycles as far as patterns go and I'm rather manic about it so it's all or nothing. All clothing, all accessories, all quilts etc. For quilts, I like quick and simple. I'm all about instant gratification! My favorite patterns are one of two: quilts that are cut with a rotary cutter (this girl hasn't mastered the round stuff yet) and simple garments (my husband just got me my first ever dress form), but simple garments because of time not skill. Love sewing! I love strawberry fields.I bought i fat quarter bundle and it's just perfect to use your recipe.Thank you for the great tutorial. I love traditional patterns.and love to use precuts too. I'm new into this quilt-world so I don't have any favorites yet. Most of the time i like small quilts so I can change all year round. All the pre-cut are fun to use…. all the fabrics match together. I'm fairly new to actual quilting, but love the different designs, both traditional and modern! I adore the Strawberry Fields collection and love your pattern here! Thanks for the opportunity! I started quilting 10 months ago and I just love all the pre-cut fabrics: always a great colour range! That's me at the start of my quilting progress, for I have progressed: my sewing is much more accurate than 8 monts ago!. I have started on more intircate patterns where accurate sewing is a must. It's OK sometimes, but not always. I like paper piecing too. I'm currently making a quilt of a map of the village where my father-in-law was born. The map is from around the time he was born, which was in 1931. Just this morning I woke up and knew instantly how best to tackle this quilt. Such a relief when there's light at the end of the tunnel! I'm already a follower and a fervent one! I love your sweet quilt on MBS, and I have to admit I love pre cuts too. Thanks for the tutorial! I like your tuto at MBS ! I'm patchwork's beginner so pre-cut fabrics are easy way for me. Tank you to propose giveaway ! I love pre-cuts, specially charms and jelly rolls. Thanks for the giveaway! Love your recipe on the Moda Bakeshop. I'm very much a beginner, I've only made one quilt so far, so pre-cuts are definitely the way to go for me at the moment. I don't yet have the confidence to pick colours that will match or to cut accurately enough for a whole quilt. Thanks for having the giveaway! I enjoy making up jelly rolls and layer cakes and am always looking for patterns that make the most of the fabric. Thanks for the give away. I'm crazy about charm packs and jelly rolls. Almost instant gratification! Your Strawberry Fields quilt on MBS is adorable. Mine is patterns using pre-cuts. I find it hard deciding which fabric to use, so pre-cuts help a lot. Sometimes I get lost with all the cutting before hand and get frustrated… can you tell I am a new quilter! I am very impatient and want to start sewing straightaway. I am fairly new at this, and have made a few small quilts and one big rag quilt 🙂 I follow your blog and love all that you do, love the MBS tut! I tend to "gather" supplies to make quilts using precuts but have a stash of fabric that would make your proud. I need to sew more! I like intricate quilt patters showing the quilt in more than one color way and with several size options. Congratulations on your Moda Bakeshop tutorial! Happy quilting. I've been checking out your blog for a while now, and have to say you're a great source of inspiration. I think your tutorials are fabulous, and I've already made one quilt based on your Tiffany Diamonds quilt. I'm a hopeless fabric case too, just cant get enough of the stuff, so please count me in the giveaway! Ooh almost forgot, I love patterns for quilts (esp precuts), and totes and purses too! Your tutorial was lovely, thanks for sharing. I love tutorials with step by step photos, they make the patterns easy to understood. I like all kinds of quilts, except artsy stuff. Any quilt I have could either be hung on the wall, or used to snuggle under. You have great tutorials! I tend to like smaller projets…mostly accessories. Love the quilt Jera. My favorite patterns are quilt patterns. I think this will be my pattern for the Hands2Help Charity Quilt. I'll be using FQ and cutting them into 10" squares. I have an extra layer cake just waiting for a project and now I've found it with your latest tutorial… although I like all kinds of sewing projects, I think I enjoy making lap size quilts the best. And of course if they're easy but look complicated, all the better to collect oohs and aaahs! Gorgeous quilts, Jera! I love making intricate quilts, particularly machine applique. While I enjoy lieflike designs, I'm also attracted to the fanciful. I have found that pre-cuts (love Moda!) give me the perfect small pieces for my applique work. Types of quilts and projects you can do with them are so numerous! I am really on the jelly roll kick right now. I mostly like any kind of quilt pattern that uses scraps – I love the look of a scrap quilt! Whata fun project! My favorite patterns ar eones that can be tweaked a bit. I like to follow a pattern, but also fina a way to make it my own. Thanks! I like the intricate patterns, but those take a while. Sometimes I need instant gratification so the pre-cut packs and the simple patterns can give that to me! I love your site, there are a couple of your patterns that are now on my project list, was even able to pick up the fabric at an April Quilt Shop Hop!!! Thanks for the great giveaway and congratulations on your MBS project. I like to make up my own patterns with emphasis on the intricate side. I love your work! I had seen your quilt for Japan, but apparently didn't really see it. When I looked at 'Strawberry Fields Forever' I had to go for more coffee as I thought I was seeing some really weird stuff there but then realized it was the design – well done. I haven't really found one specific thing that speaks to me as they all speak to me (quilts, crafts, clothing, etc., as long as it is with needle and thread). I just have to be careful as there are times when the grey matter starts to seep from my head with all that I want to do – and that's just in sewing. Thanks for your great work. I love this quilt pattern. So easy and fun but it looks very intricate. I wish I could spend all day everyday sewing, when I'm not reading. My favorite things are quilts and I'd love to try some new and more challenging patterns. I also enjoy sewing fabric dolls and animals for my kids. Love, love, love fabric too. I am glad I found your blog, I will be following you and all your great creations. Thank you for sharing. I look forward to your postings – keep them coming. I like applique – modern and bright. you have a new follower! I need to learn as much as I can. I like the color selection, cutting and piecing of a quilt – own several precuts but have never used one, now I have a good incentive to use one of the two layer cakes I have. Thanks for the tute. Love the quilt…and the fabric! I LOVE tutorials! I tend to go for simple patterns. Love the quilt and have added it to my list. This is my kind of pattern. If I have to stress about it, making lots of points and seams match, I don't have as much fun. I love to keep it simple! I really love to sew clothes for my girls… but I can see a not-too-distant future when they won't be into wearing homemade clothes anymore, so this year I decided to dive into quilting. So far, I've finished two and I'm loving it! Thanks for the tutorial- can't wait to try it! My first visit to your blog – very nice !! I now have you bookmarked!! Your Bake Shop quilt is simply fun and easy – something we all need. My love in quilting is hand applique, probably because I can use lots of fabrics – another reason I like your Strawberry Fields quilt! Recently made a 3 color quilt and it felt like it too forever! Looking forward to visiting your blog often! I love the quilt! And the fact that it is so easy, makes it even more favorable! That's my favorite kind of pattern….Easy! Beautiful quilt! I tend to be more fond of simple, precut quilt patterns. Just the other day I was admiring the Strawberry Fields fabrics and thinking how it could make a cute quilt for my daughter! Thanks for the tutorial! 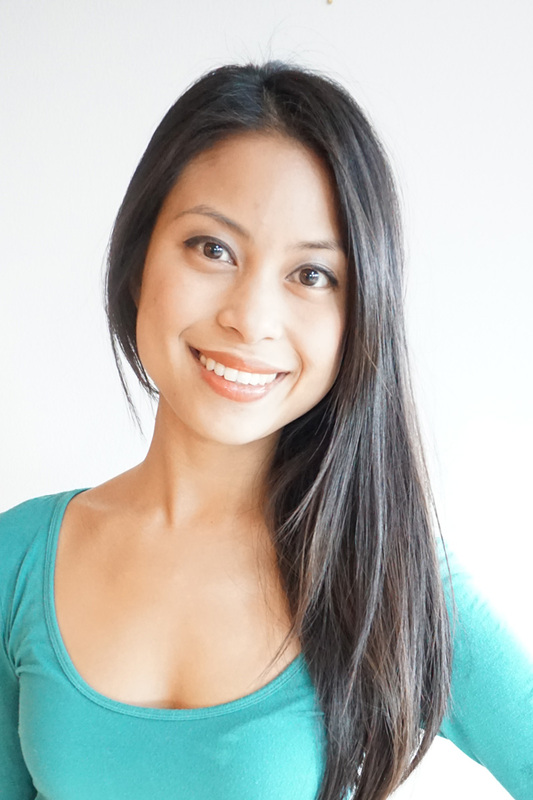 I love your tutorials, congrats on another one at the MBS!!! My favorite kinds of patterns right now are intricate and modern quilt patterns. Thanks for the opportunity to win some fabric, I am also addicted! Sorry I don't have a comment account set up yet, my name is Adriane from WI. Beautiful quilt. I love the strawberry fields fabric. I love tutorials and any and all patterns based on the traditional nine-patch. I don't know how I ever finished a quilt before pre-cuts. jrt0812 at yahoo dot com. I love your Strawberry Fields pattern! I love using pre-cuts. It's exciting to have the chance to use every fabric from a whole line, without having to buy yardage of each one. The variety makes my projects feel so much more fun. Again, love your tutorial on MBS – I'm definitely going to make this one!!! Hi all, I just starting quilting a couple years ago and really love the precuts because they coordinate so beautifully and seem to cut down on time for getting my pieces together. We just had our first baby about 18 mo ago and I've really gotten back into quilting and sewing! I love your strawberry fields quilt, I think even better than the quilt for Japan, though it's a softer look. My family is from Seattle but I moved to Southern WA about 6 yrs ago and have lost touch with sewing Seattle- what are some great fabric stores in Seattle? Is Pacific Fabrics a good one? Anyway, happy sewing fellow northwesterner!! Thank you for the chance to win a layer cake! My favorite patterns are pre-cut quilting patterns, and also clothing for my 18 month old daughter. It is so fun to make her little tops and dresses! shoot! I forgot to leave you my email! kasiaboslaugh at gmail dot com for Kasia B comment- but I liked on facebook so that might help too. Your tutorial is great. Thanks. Pre-cuts are great for fast quilts. Love this one! I have a "It's a Hoot" by MoMo that would work perfectly. My fav are patterns that work for pre-cuts so that I can have the option of using my pre-cut stash or just cutting from my yardage stash! I love simple patterns that showcase the fabric, also small projects like zip bags, etc. I'm also considering the Brother XL 3750, eagerly awaiting your review. I've learned so much from your blog, thanks for all your hard work! I like precuts and kits because I'm color challenged. LOVE your blog. Applique patterns! I love needleturn applique so I'm always looking for something new and fun. I love using pre-cuts because they really cut down the time required to make a project in a hurry!! Thanks for the chance! I love pre-cuts expecially jelly roll! !But I love very much machine appliquè also. Thank you very much for this giveaway!! I love any pattern using precuts. I'm really new to quilting, so I feel like this makes it so much more enjoyable at this stage in quilting to have precut fabrics. Thanks for doing this giveaway! I'm a beginner, and I love pre-cuts and a quilt pattern to guide me through the process… Thanks for a chance! I love this pattern, simple enough to make for a newbie, and it looks great. I love precuts and I may have to try a layer cake now. Since I just began quilting this year, I am loving the pre-cuts. It makes it easier on a beginner like me when I can just take it out and sew. However, I just finished up a project where I used yardage and I found it very satisfying to cut all the lengths myself. Pre-cuts are easier though! LOL. I really don't enjoy fussy cutting, intricate patterns yet, as my skill level is just not quite there. Simple patterns are best for me. I love pre-cuts. Your MBS quilt looks like so much fun! Can't wait to make it. I like a nice easy pattern. A pattern that only takes a few ays to put together. I love pre-cuts also. It's pattern and colour that attracts me…fabric and paper, so two serious addictions! LOVE the wonky 9-patch squares. I will make one of these for sure. I mostly sew charity quilts from my stash but will occasionally treat myself to a Jelly Roll or Layer Cake. Just finished a Moda Bake Shop recipe that was very fun. I don't do curved piecing. Yet. Right now I'm really into tabletopper patterns and have been using charm packs. Thanks for this. My fabric patterns use pre-cuts because it is so much easier to have all the fabrics coordinated in a bundle. Thanks for a chance to win your layer cake! my favorite kind of patterns are quilts and its always a plus if they use precuts! precuts are heaven!! They make quilting 'sew' much easier! I like simple quilt patterns with fabulous fabrics. I like "things" that are easy. Although I have been making clothes, toys, and accesories for over 40 years, I am ready for easy and fast. BTW, this quilt falls into my list. The quilts are beautiful and so inspiring,I want to make one now too! Love the tutorial at MBS, a clever quilt for sure. I LOVE it!!! I like the scrappy look of it. I like patterns that use charm packs and layer cakes because I can get so many different colors and designs without the stress of choosing them myself. And I like either the very simple patterns or the one like yours that end up looking very "scrappy". cant wait to get started on this quilt…. I seem to be into precut patterns right now…. Hence how I saw your post on Moda bake shop. With five kids, I am lucky I get a quilt made,so the precuts save on a lot of time. thanks. Having just completed my first quilt top, I'm loving fun looking but simple quilting projects. Your post on Moda bake shop was my original introduction to quilting, so thanks a ton! Great blog! I like patterns for small projects and fairly simple quilts that use time-saving techniques. In particular I enjoy patterns for applique and designs using charm squares, strips, and scraps. I am new to quilting and still getting my feet wet. I have only tried some really basic blocks…but am venturing out with a BOM!! I have the Sunkissed layer cake and keep holding it wondering what to do with it…well now I know!! Thanks so much for sharing!!! Precuts are like candy to me, and I love patterns that use them creatively (like yours!). I'm a quilter, through-and-through–not a garment-sewer in any way shape, or form! I enjoy all categories of quilting–traditional, modern, art, complex, simple…you name it, I'll drool over it! I've always liked traditional patterns with soft colors like rose and cream, e.g. Miss Rosies color choices. Recently I've discovered to make these blocks wth more modern fabrics, with batiks or with clear, bold colors. I find that the results surprise me everytime very pleasingly anew. I love anything! 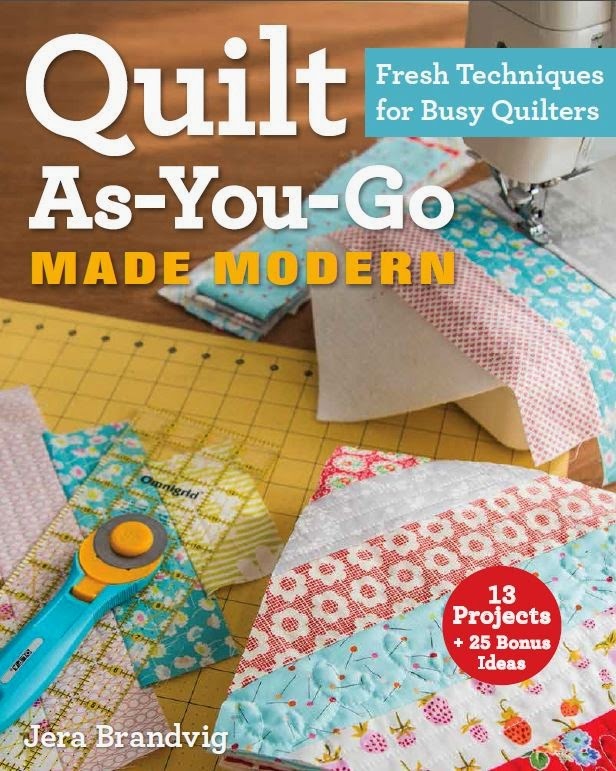 If I am trying to make something quick, then precut is the way to go, but if I find a fabric I love I will cut it up 🙂 Love your blog and all your quilts and crafty things you do! Have a great day! I love traditional quilt patterns. With only a certain amount of time to sew, I don't like to fight with fabric or pattern directions. Precuts are a dream, and your MBS tutorial is wonderful. Thanks so much. I STARTED OUT OVER 30 YEARS AGO AND LEARNED EVERYTHING THERE WAS TO KNOW ABOUT MAKING QUILTS. I LEARNED HOW TO HAND PIECE, APPLIQUE,QUILT, JUST EVERY TECHNIQUE I COULD FIND A CLASS IN. NOW SO MANY YEARS LATER I STILL WORK FULL TIME AT OUR BUSINESS WHICH LEAVES NOT A LOT OF TIME FOR MY QUILTING. I HAVE BEEN INTRODUCED TO JELLY ROLLS, LAYER CAKES, ETC. AND HAVE LEARNED ALL THE SEWING MACHINE TECHNIQUES. I AM HAVING SO MUCH FUN AND AM PRODUCING MORE QUILTS, WHICH GIVES A REAL SENSE OF ACCOMPLISHMENT. AND MUCH THERAPY AND RELAXATION. Enjoyed your post on MBS – the step-by-step directions are very good. My favorite precut is FQs, because I think lots of fabrics in makes quilts more interesting and keeps the eye moving through the design. I've never made a quilt with a layer cake and would LOVE LOVE to try with your MBS pattern. I have only been quilting since January and I am on my fourth quilt and I love it. I love using pre-cuts but I am now venturing onto patterns. I enjoyed your post on MBS. I like precut patterns. Thanks for the giveaway. I like pre-cuts and patterns that use them. I also like scrappy quilts. I like your new banner, too! I love this quilt pattern! Thanks for the tutorial! I'm addicted to pre-cuts. I LOVE your tutorial, thank you! Can't wait to try it! I heart precuts! Thanks for the tute! I've done stack and slash crazy quilt blocks – lots of fun. Oh, I love this quilt pattern. Even though I'm an experienced quilter, I still love a simple pattern. Your tutorial is great and I'm definitely going to try it. I tend to like the precuts, especially the 2 1/2-inch strips, but I also like fat quarters as I don't like having to cut into yards of fabric. I love simple tutorials or patterns that are easy to follow. I think your tutorial is great! Your quilts are lovely. My favorite patterns are quilts that can be made scrappy. Easy or hard, doesn't matter. I also love patterns for baby quilts and "test" many quilt patterns by making a smaller version as a baby quilt. That way I can see how well I like making the pattern. By the way, I also have a serious fabric addiction. Not that uncommon, I'll bet. I love patterns using pre-cuts. I check MBS almost daily looking for new and fun patterns. How different those two quilts look. Umm…I like to find tutorials on blogs. I like to see the process and I want to make one too. I havent been using too many store bought patterns lately. At this point in my life the only quilts I have time for are simple ones but I would love to try some more complicated ones – I love a challenge when it comes to crafting! I have been sewing my own clothes since I was a teenager. I would love love love to win this layer cake! Just learning and trying everything! Think this layer cake idea is just right! I'm very new to quilting but I like the easier patterns using pre-cuts. Hi! I have been quilting a long time, but I still love simple quilts. I also love ones using pre-cuts. Since I also love scrap quilts, I cut my scraps in "pre cut" sizes…so I can use my pre-cuts or buy pre-cuts!! I love this quilt. It looks so complicated until you explain how to do it. My dilemma is to decide which fabric to use!!! 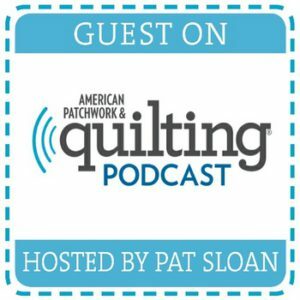 I love all aspects of quilting…. I do think pre-cuts and pre-cuts patterns are a God send for the "Have to have it Tomorrow" projects. I actually like both rotary cutting and pre-cuts and often mix the two. Currently I'm doing a MBS quilt for a little girl in hospital. I love the MBS! And I love this quilt. And I love Breakfast at Tiffany's even more. I have some awaiting a postage stamp quilt. I've been sewing for over forty years and I love sewing everything. Today I worked on a bag, a little girl jacket and some embroidery with patchwork for a quilt. I've just found the Strawberry Fields quilt tutorial through MBS and can't wait to have a go. Thanks for the easy to follow instructions. My stash is mainly fat quarters but I love the look of the Breakfast at Tiffanies layer cake – good excuse to go shopping!!! My favourite quilts have a few stitchery blocks in them and I love to make bags and cushions etc as gifts. Gloria, Christchurch, New Zealand. This is getting done this summer. What a great pattern. I love patterns that use precuts. But what really draws me is looking at the pattern and knowing who I will make it for. This is for my grandaughter. pretty! My favorite patterns are quilts that use fat quarter cuts, they're so versatile! Oh I love precut patterns. Being a mother I just don't have time anymore to piece together my own fabric choices or cut all the needed stuff from 1/2 yards. Thanks for the tutorial, it looked hard at first but now I see it will go quickly and fairly easily. I like quilting patterns. Pre-cuts are nice patterns, although I usually don't use pre-cuts. Congrats on your Moda post. What a fun MBS tutorial! I really like simple patterns with lots of color variety, and using precuts is fun primarily because i get the whole line of fabric to have that variety. And I love MBS tutorials! I haven't used too much pre-cuts but I like quilting patterns. Haven't ventured too much into garment patterns but that's in my next step! Congrats on your Moda post – great tutorials! I love making my own patterns, I love love love sewing pillows and quilts. Usually I get distracted and start on something else. I have several unfinished quilts. My goal for the summer is to finish them all! I like a variety of patterns from those that require pre-cuts to those that deal with yardage. The design is what catches my eye. But I truly do love your designs so keep designing. I love patterns that are not really difficult, but look like they are. I love blocks that form secondary patterns and look really different from the original blocks. Thanks so much for sharing your design on Moda Bakeshop! Have a great weekend! I like easy projects, whether it involves precuts or cutting my own fabric. Simple, like your Rainy Days Quilt. Thanks for the great giveaway! I really like working with Charm packs. I've not used a Layer Cake yet, but they look fun too. I have used several Schnibbles patterns using the Charm packs. Thanks for the great giveaway. I love your tutorial! I have a layer cake and now I know what I am going to do with it! My favorite kind of patterns are clothing patterns for kids and house decor usually using pre cuts! What a great site. Im so happy I found you! I love doing simple quilts. My next one is going to be a strip quilt, maybe a brick strip quilt. I've never done one of those before. I also love your tutorials! Oh wonderful! Thanks for the opportunity to win something fun. I have been having alot of fun learning new quilt patterns, I think my favorite pattern so far is the disappearing 9 patch. I love how random it can be and how versatile. I love precut quilt patterns for the ease of putting them together, but also sometimes like intricate appliques etc that take more time and are good ongoing projects. I love your quilts. Sunkissed and Strawberry Fields are two of my favorite lines. I like to use traditional patterns, but also love using all the great patterns for precuts. And occasionally I make accessories like purses, Christmas stockings, etc. I am a precut quilt pattern girl. I think because it saves me time. Thanks for the giveaway I love following your blog! I'm a newbie quilter, and am going for simple patterns – nothing intricate yet! Maybe someday. 🙂 Thanks for the nice giveaway! Love your pattern on MBS. It's nice to have a pretty option for layer cakes, I find them a bit tricky to use even though they are so beautiful. My favorite patterns are the simple ones based on classic blocks but maybe with a modern twist-the visual tutorials on MBS are the best! Love your "Strawberry Fields Forever" it is a perfect summer quilting project! I love the modern patterns, especially those derived from a classic pattern. I'm a newbie to quilting, so the simple quilts are what I go for…but I love looking at some of the intricate ones and hope that maybe one day I'll have the time & the knowledge to make one. I also sew kids garments & bags, but nothing too fancy as I don't have time. Thanks for the awesome giveaway! I'm just in awe of some of the things you do! I've only tried a pre-cut once so I'd like to try something else and the MBS tute looks nice & easy. I've recently posted your site on a stitch-in forum with Quilt Fabric Delights to 'spread the love', so hopefully there will be more followers soon. As for sewing, anything that is quick and easy is for me! Thanks Jera, have a good one! I love pre-cut … and I love your tutorials … strawberry is really fun!!!! pretty traditional….but really learning to love the pre-cuts!! thanks for the fun giveaway! The Strawberry Fields caught my eye as it is current at the top of my wish list. So glad I took a look. Thank you for sharing a simple tutorial that doesn't look so simple when finished. Love the patchwork with a slight twist finished look. My favorite patterns are simple patterns such as this tutorial for quilts, bags, and clothing. With seven children and another due in three months, time is a rarity so simple and uncomplicated are my faves. Thank again for sharing. I'm still skirting the edges a bit, staying with smaller projects that are managable and stretch my skills. Purses, bags, baby quilts, table runners and placemats, pencil cases, scarves etc. Trying to work up to a bigger commitment, of a larger quilt. I'd prefer simple, easy to understand instructions preferable with a tutorial on the tough parts, lots cleaar illustrations and photos to avoid getting confused and lost in the process. Possibly leaving me with the choice of fabric and colours but suggestions are always welcome. Thank-you for asking I think your work is lovely and tutorials are very comprehensive and helpful. I love all your quilts and tutorials. I'm a new quilter and they are easy for me to understand. I do various quilting patterns, but seem to gravitate towards fusible web appliqué. Thanks for the opportunity to win. I just love your ideas. I love fast & easy quilts OR applique. Applique is a lot of work though so most of the time I am all about pre-cuts! I am a quilter and love the pre-cuts…I can make a quilt rather quick. Thanks for the giveaway! I really love jellyrolls and charm squares but will quilt with anything! Thanks for the giveaway! I love quilt patterns for "JELLY CAKES"… a pattern that uses a Jelly roll and a Layer Cake! I have done lots of traditional quilt patterns and rotary cutting so when the pre-cuts came out, WOW! I love them all! I can find uses for any lid of pre-cuts! They are so much fun to work with! All the best! I am very new to quilting… actually I have only been quilting for a few months and loving attempting my first quilt. I love elegant, simple styles and I am just so in love with pre-cuts. Actually I just love having them sitting on my shelf for me to look at. They make me happy. Thanks for the chance. I love quilt patterns that are easy to cut/assemble, but when finished and you see it can say "WOW". I have focused on tablerunners/placemats lately because it allows me to be creative and practice my free motion quilting on a small surface. I have also just started to teach myself applique! I love quilt patterns that are easy to cut/assemble, but when finished and you see it can say "WOW". I have focused on tablerunners/placemats lately because it allows me to be creative and practice my free motion quilting on a small surface. I have also just started to teach myself applique! 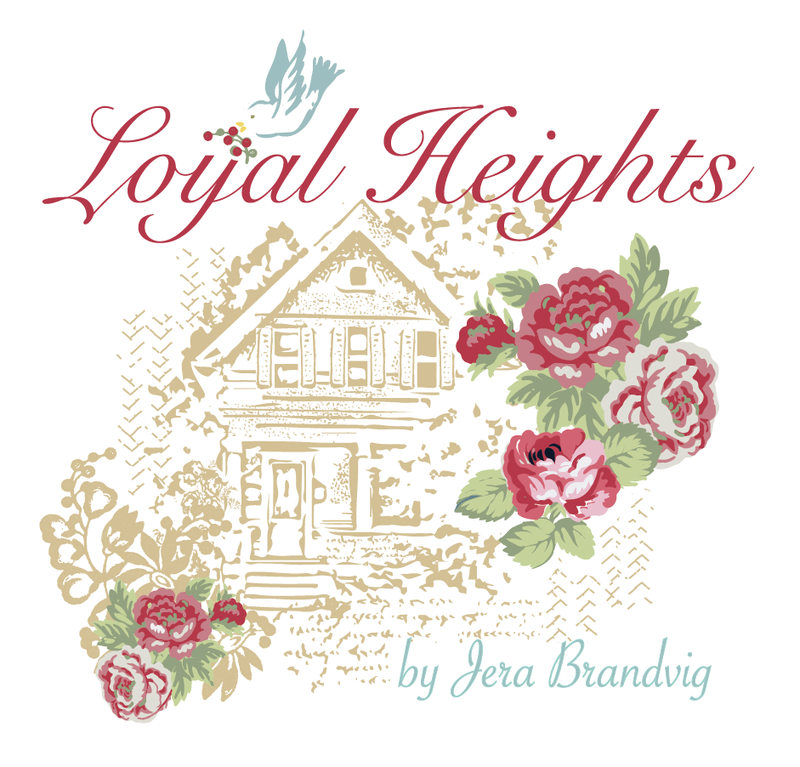 AND more important-Jera is my inspiration for renewing my passion for all things sewing and fabric! Right now I'm mostly into garment sewing but I've definitely enjoyed making the couple of quilts that I've made too. Honestly, anything that gives me an excuse to sit down at my sewing machine for a few hours is exciting in my book. I love this fabric and the pattern is wonderful. I would love to make this for my niece who is turning 5. Thanks! Just found your blog and it is now number 1 on my favorites! Precuts are fun, but as to my favorite patterns, I guess all I'll say is "well written ones"! I love to piece, I love to needleturn applique, love home decor – I do everything but fashion sew (although I used to do that). If a pattern's clear and well written, it's a joy. Lots of pictures are a real plus! Love your blog and your MBS quilt! It is so nice to know that others have a fabric addiction as well. I also have a pattern addiction. Your tutorial was great! 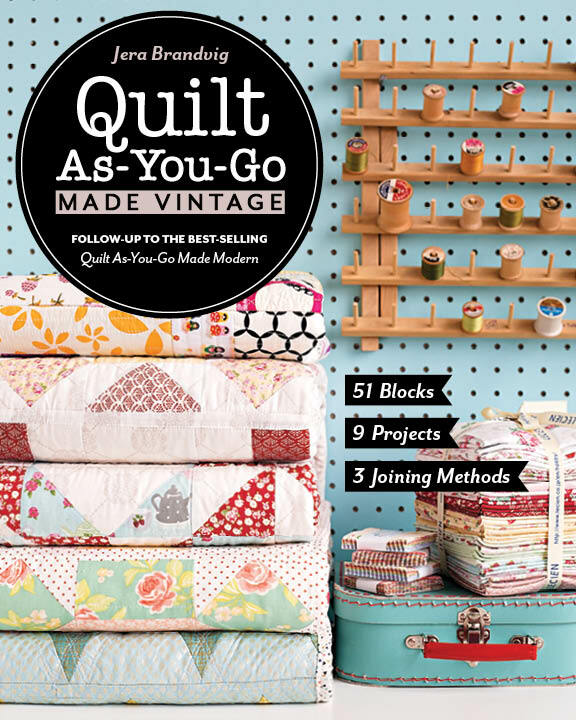 Love the quilt and tutorial. I make quilts using precuts and potholders and small clutches. Thanks for the awesome giveaway! I really like patterns that are easy to follow and show off the fabric used, and I love using pre-cuts as you easily get to use a whole range of fabric. I enjoy using pre-cuts. So I'm always on the lookout for patterns and books that them. Thanks for the giveaway. I like to do a variety of things and right now I am interested in I-spy quilts. I love your quilt and your blog! I'm pretty new to quilting; and I gravitate towards pretty modern quilt patterns. I love precuts but I don't limit myself to using only them. Sweet quilt and you make it look really easy. I like all kinds of patterns and have made all kinds….applique, precuts, and the classics are always fun like nine patch and log cabin….so much you can do with those patterns. I LOVE sewing clothes for little girls. I have two little gypsey's, two and three, who love nothing more than hand made frilly skirts and scarves and belts! My second love is vintage inspired quilts. 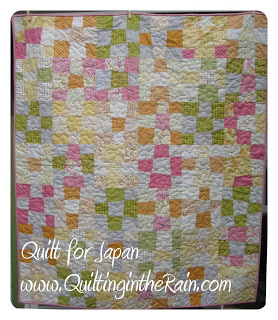 Your Quilt for Japan is so vintage in the Strawberry Fields, can't wait to try it. thanks for the chance to win! My favorite kind of patterns are quilting patterns. I love patterns using new twists on traditional blocks. I would love to win! Have a great day! Being a newbie, I am enjoying simple quilt patterns that I can finish *relatively* quickly. that being said, I am looking forward to having the skill & patience to do more traditional and intricate quilt patterns. I just started applique a little while ago so right now I'm looking for patterns with both machine and hand applique. Thanks for the opportunity to enter your giveaway! I love all your tutorials! I just finished my quilt top of the Tiffany Diamonds today, now I'm working on a second one for my boyfriend! really liked your MBS quilt. I am a new quilter, and it seems my eye is drawn to two types of quilts. The very intricate (ones I could never finish).. and those that are pieced but with large simple pieces, giving it shape and flow.. but not just squares. I would love to do this with precuts so that it could have lots of color. Your quilt at the MBS is wonderful!! I loved it the minute I saw it!! I love quilt tutorials, and ones that are a little more "labor intensive". Precuts are handy for a quick quilt and I love that everything matches perfectly! I don't have the patience for intricate blocks but admire the work and beauty. Having said that… I do love applique quilts (small ones). Thanks for the chance! Oooooh! I think I like this kind of layer cake even better than real layer cake! Yummmm. I love your Strawberry Fields pattern and hope to make it this summer.Most of all I love scrap quilts.Thanks for giveaway. Oh, I love patterns for precuts most! I really love patterns to make table runners or table topper! I enjoy patterns for precuts. Thanks for a chance to win! I have to say I like the easy patterns when I'm under pressure to get something done. I'm slowly starting to learn more difficult skills and realizing I need LOTS more practice and patience. Thank you for the giveaway! Wow! Lovely! My favourite kind of pattern is for intricate things that I'm not likely to figure out for myself without a bit of work. Like bags with different shapes. Or garments. Or some of the cute pincushions there are out there. Thanks for a chance to win. I had already bookmarked your Strawberry Fields recipe over at Moda BS as I really like sewing with precuts. What I like even better are quilt-a-longs or BOMs that use pre-cuts. I can easily make 1 block a month or week or whatever and it is so convenient when the designer shows you how to cut the block from the precut(s). So I'd love to win the layer cake – thanks for the chance. Hi! Maybe you've already drawn the winner, but I tried all Thursday evening and Friday morning, but Blogger wasn't letting me comment. I'd love to enter if there's still time. Thanks! I love simple patchwork and strip quilts, allows the fabrics to really shine through. I also like to make dolls, stuffies and pillows with my daughter. I love strawberry fields. I tend to buy quilt patterns just because I like them – I learn from each and every one of them. I'm just starting to broaden my horizons, so I'm trying not to limit myself. Great tutorial 🙂 I love how your fur babies are also featured in your posts! Too cute! My favorite patterns are ones like the disappearing 9 patch, in that they have that secondary cut or step to them, that totally changes the end result and very unpredictable :)Great question. I love to read the others' comments too! I am very new to the craft, but I love the patterns using pre-cuts. I have rheumatoid arthritis, and I find they save me so much time and effort! I love simple patterns that have less than 20 pieces – less than 13 is better. Love layer cakes. Thanks for the giveaway and I like your tutorial. Hello, I love reading through your blog, I wanted to leave a little comment to support you and wish you a good continuation. Wish you best of luck for all your best efforts. Garments accessories, Garments accessories manufacturers.